The following quote from Fred Jameson has been discussed a great deal on the internets as of late, "It seems to be easier for us today to imagine the thoroughgoing deterioration of the earth and of nature than the breakdown of late capitalism; perhaps that is due to some weakness in our imagination." In some way this statement cannot be disputed, however, I want to stress that the weakness of the imagination, the fact that we must always imagine the end of the world in some specific form, reveals something. In some way it is a matter of what could be called the apocalyptic sublime. The end of the world is too big, it is beyond our capacity to envision, yet that does not keep us from imagining it, representing it, in some finite way, nuclear holocaust, zombie invasion, asteroid, etc. The specific image reveals something of the historical situation from which we imagine. Which is why every generation gets the apocalypse it deserves. First the basic plot, it concerns a father and son making their way south across a barren post-apocalyptic landscape. The specifics of how the world came to an end are vague at best, although, the cold and ashen snow suggests that it takes place during a "nuclear winter." However, the book is not situated in the immediate aftermath. This is not the day after. All animal and plant life has ceased to exist, and human beings are left to cannibalism or foraging for canned goods. In some ways the book is almost post-post-apocalyptic; in that it takes place after the dramatic struggle for survival that makes up the plot of most post-apocalyptic stories. When the novel begins even the murderous gangs have begun to die out. This is the end of the end. What interests me is the way the novel sketches out some sense of the social and political dimensions of this world. For the most part the novel focuses on the relationship between the father and son, which is a fragile bound of love in a world that constantly threatens to destroy it. This bound is set against the threatening cannibalistic gangs, "bad guys" as the boy puts them. Now, at some point in reading this novel I became frustrated with this, despite its enthralling prose. It began to seem reactionary, the family against brutal society. However, I now think that there is more to it than that. At a few points in the novel the characters refer to "good guys," to even "communes." But these are never really depicted or encountered, except almost mystically at the end. (Shaviro alludes to McCarthy's gnosticism, of a salvation that can only come from outside the world.) In some way I think that the novel is gesturing towards the limits of our own imagination. 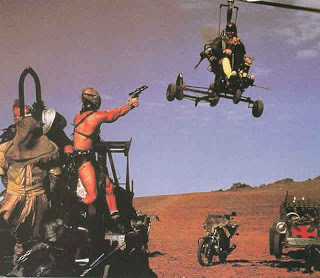 It is easy for us to imagine society collapsing into murderous biker gangs (Hence the central place of The Road Warrior in representations of post-apocalyptic world. Its dominance is an effect not a cause: it is popular because it conforms to our own Hobbesian imaginary.) It is much more difficult, however, to imagine the creation of a new world (the end of capitalism). McCarthy's novel does not try to present this, but rather draws the limits of our ability to imagine it. Perhaps the "communist sublime"? In a completely different way Idiocracy is also a story of the end of the world. Its premise is a kind of Darwin in reverse, "stupid" people continue to have many kids while the "educated" elites have few. Add to this the "dumbing down" of popular culture, and you have a future in which the slightest act of intelligence, like reading, is considered gay. Now this film clearly stems from the age of George W. Bush and Paris Hilton, and it could be considered the spontaneous ideology of Bush's America. An ideology which states that the one thing wrong with the world is stupidity. Two things about this film. First, as my friend Hasana points out it is clearly about male stupidity, women are largely absent from this future, a future of monster truck rallies, pornstar presidents, and television shows based on guy getting hit in the testicles with various objects. Second, the movie has to go to great narrative lengths to explain how such a world could be possible. Its question is not the old question posed to communists, "who will clean the toilets," but rather "who will keep the cars running." It begs the question of minimal competence, not untranscendable toil. The film solves this problem by depicting a society in which everything is either automated, like the touch screen keypads at the hospital, making a diagnosis no more complicated than ordering a Big Mac, or in crisis, like the system of agriculture. In doing so the film stretches to the absurd suggesting, albeit obliquely, that stupidity is not a sufficient cause to destroy the world. In other words, while the world may appear to be stupid, that is only because the intelligence has become automated, placed in various machines, human and inhuman. Finally, I should add that the film is completely oblivious to the existence of class. This is the main way in which its imagination of the end is circumscribed by the existing historical moment. It posits stupidity as an entirely natural phenomenon. It sees it as a cause, not an effect. It fails to see stupidity as a product of capitalism, as Marx writes, “It replaces labor by machines—but some of the workers it throws back into a barbarous type of labor, and the other workers it turns into machines. It produces intelligence—but for the worker idiocy, cretinism.” Having said that I did not hate the film. That one line, "You like money too?" Hil-a-rious.